We are Manufacturer and Trader of Steam Pressing Table. 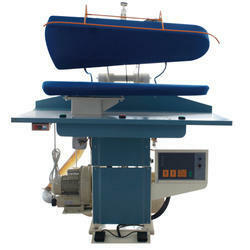 We are passionately engaged in manufacturing and trading a quality assured array of Vacuum Steam Press Table. Under the guidance of our veteran professionals, the offered pressing table is precisely manufactured using the best grade components as well ultra modern technology at our premises. 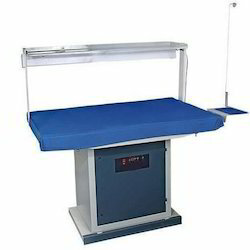 This pressing table is used for ready-made clothing, final ironing and intermediate ironing systems in garment industry. In addition to this, the provided pressing table is highly appreciated in the market due to its varied qualitative attributes. Flat top ironing table with optional swivel arm with buck for ironing of smaller parts. 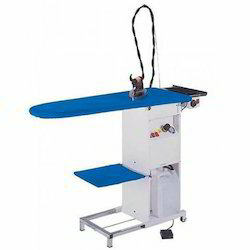 Being the most respected organization guided by experienced and knowledgeable professionals, we provide an enormous assortment of Steam Press Table. The provided press table is manufactured with utmost care using topmost quality components under the guidance of our knowledgeable professionals. 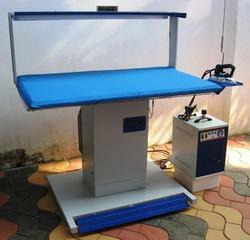 This press table is available in different technical specifications and models for our clients. Our offered press table is checked against numerous quality parameters to ensure its long service life.